Locking on File introduced with java.nio package that implemented by FileChannel. A FileLock is two types exclusive and shared. A shared lock allows other concurrently running program to acquire overlapping shared Lock. An Exclusive lock doesn’t allow other program to acquire overlapping lock. Lock ideally supports shared Lock but it depends OS if OS doesn’t support share lock then it will act as exclusive locking. Locking applied on File not per channel or thread means if channel obtained the exclusive lock then other JVM’ channel will be block till first thread channel resume the lock. Locks are associated with a file, not with individual file handles or channels Locking applied on File not per channel or thread means if channel obtained the lock before processing the file then other JVM’ channel will be block till first thread channel resume the lock. Since Lock is on File therefore it is not advisable to use lock on a single JVM. The FileLock (long position, long size, boolean shared) acquire lock on specified part of a file. The region of file specified by beginning position and size whereas last argument specified if lock is shared lock (value True) of exclusive (value False). To obtain the shared lock, you need to open file with read permission whereas write permission require exclusive lock. We can use lock () method to acquire lock on whole file not the specified area on file. File can grow therefore we need to specify the size while obtaining the lock. Method tryLock on specified area or on full file doesn’t block/hold while acquiring a lock means it immediately return value without going to wait to acquire lock. If other process already acquired lock for specific file then it will immediate return null. FileLock API specified as below. The FileLock encapsulates specific region, which is acquired by FileChannel. FileLock associate with specific FileChannel instance and FileLock keep the reference of FileChannel that could be determining by channel () method in FileLock. FileLock lifecycle will start when lock method or tryLock invoke from FileChannel and end when release () method called. It FileLock also invalid if JVM shutdown or associated channel closed. isShared() method return whether lock is shared or exclusive. If shared lock is not supported by operating system then this method always return false. FileLock objects are thread-safe; multiple threads may access a lock object concurrently. Finally, overlaps(long position, long size) return if lock overlap the given block range or not. A channel uses ByteBuffer to transfer I/O from source buffers to target buffers. We can pass the data into Buffer, which send to Channel or Channel push the data into Buffer back. Channels provide direct connection with IO to transport data from OS ByteBuffer and File or Sockets. Channel uses buffers to send and receive data, which is compatible with OS ByteBuffer and minimize the overhead to access the OS’s filesystem. A channel provides open connection to I/O such as network socket, file etc. to read and write operations. Channel could not directly open but could be open by calling open method on RandomAccessFile, FileInputStream, or FileOutputStream object. A Channel interface provides close method and once channel closed it could not able to reopen and throws exception ClosedChannelException. The InterruptibleChannel interface is marker that could be asynchronously closed and interrupted, means if a thread is blocked in an I/O operation on as interruptible channel then thread may invoke close method asynchronously. WritableByteChannel interface that extends Channel interface provide write (ByteBuffer src) method to write a sequence of bytes to this channel from the given buffer. RedableByteChannel interface have read (ByteBuffer) method that reads sequence of bytes from channel into the buffer passed as argument. Only one thread can invoke read operation and if other thread initiate that time it will block until the first operation is complete. The NIO provide concretes interfaces with various implementation in SPI package which could be change by different provider. SelectableChannel uses Selector to multiplex ByteBuffer. Package java.nio.channels.spi provide implementation of various channel. For instance AbstractInterruptibleChannel and AbstractSelectableChannel, provide the methods needed by channel implementations that are interruptible or selectable, respectively. A Channel handle communicates with I/O in both direction similar to InputStream and OutputStream. It is capable to handle concurrent write & read, means it doesn’t block I/O to be read or write. There are two types of channel File and Sockets. Sockets channels are three types SocketChannel, ServerSocketChannel and DatagramChannel. Channel could be created in several ways for instance socket channels have factory method to create new socket channels whereas FileChannel could be created by calling getChannel () in IO Stream / RandomAccessFile. Channels could be unidirectional or bidirectional for instance if class implements ReadableByteChannel and WritableByteChannel both then this class will be bidirectional channel but if class implements any one of them then it will be unidirectional channel. Selector provides capabilities to process single IO operation across multiple buffers. Selector class uses multiplex to merge multiple stream into single stream and DE-multiplex to separate single stream to multiple stream. For example write data is gathered from multiple buffers and sent to Channel. Selector operation intern call OS native call to fill or drain data directly without directly copying to buffer. Operating System allocates memory to JVM to process its task. In old JDK (>1.4), JVM uses FileSystem API to access file from hard disk which is quite burden to JVM because there is no direct reference between JVM and File inside hard disk. JVM uses Operating System system calls to access file. Operating System stores files into large ByteBuffer, which is quite large compare to byte stream used by JVM. 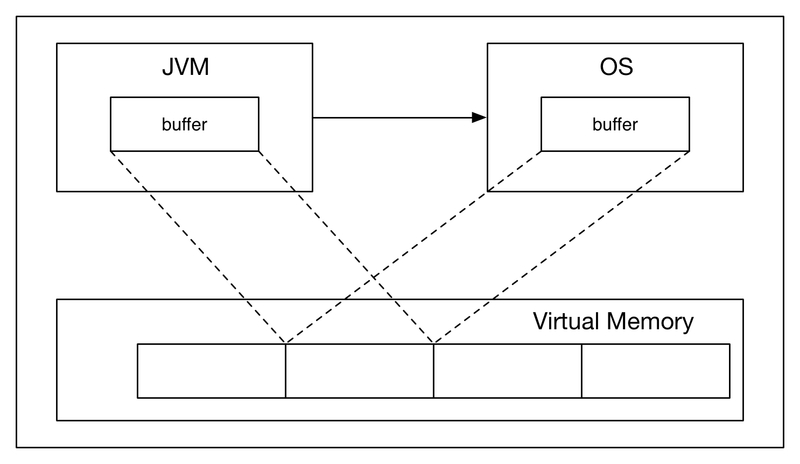 JVM uses extra efforts to convert ByteBuffer to byte stream and vice versa. For large file OS uses Virtual Memory to store data outside of RAM. The benefit of Virtual Memory is that it is sharable across multiple processes and hence VM could be accesses by OS and JVM both. From transferring data from OS to VM could be quite fast by using DMA (Direct Memory Access) whereas transferring data from VM to JVM is slow because JVM does extra efforts to break large data buffer to byte stream. JAVA FileSystem: Java uses FileSystem API to access physical storage inside system. When client try to access a particular file via FileSystem, FileSystem identify storage location and load those disk stores into memory. File’s data stores into multiple pages and page contain group of block. Kernel establishes mapping between memory pages and filesystem pages. JAVA NIO that introduce JDK 1.4 and keep enhancing on newer version improve the I/O operations. It provides new type of buffers such as ByteBuffer, CharBuffer, and IntBuffer etc. that reduce the overhead during transferring data from OS to JVM. Java NIO could be able to map directly from VM to JVM bye using new ByteBuffer. 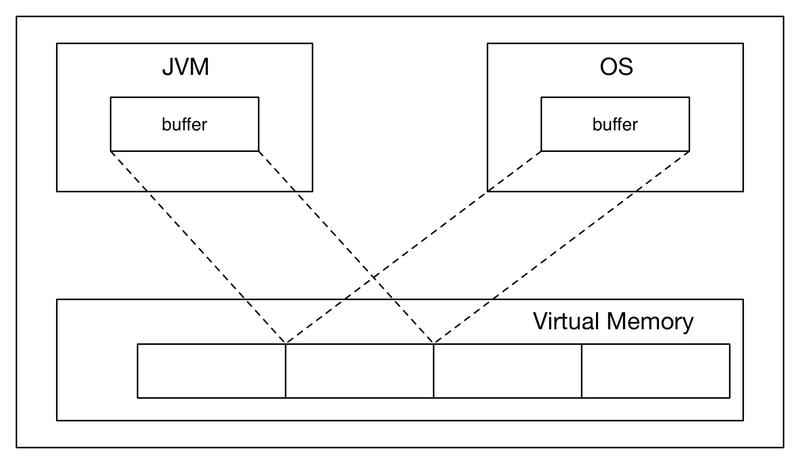 JAVA ByteBuffer is same as OS Byte Buffer that’s why it could be easily mapped from OS Byte Buffer to JVM Byte Buffer so less overhead on data conversion from OS to JVM. As per above diagram if OS uses VM and JVM use newly NIO interface, it enhances the performance while processing file especially large file. We will also discuss later there are another MappedByteBuffer which have capabilities to directly process the file in VM without transferring data from VM to JVM. The synchronized modifier is used to control access to critical code in multi-threaded program. The synchronized keyword is one of the tools that make your code thread safe. The “Synchronized” modifier in Java prevents concurrent access code block or methods by multiple threads. Synchronized force threads to obtain a lock before entering the method and release the lock after completing the method. It ensures that only one thread can execute the method at a time. If we make method or block as synchronized then it will not allow more than one invocations on synchronized method on the same object. If one method invoke synchronized method other thread block until the first thread complete the method execution. When you mark a block of code as synchronized you use an object as a parameter. When an executing thread comes to such a block of code, it has to first wait until there is no other executing thread in a synchronized block on that same object. However a thread could enter the block of synchronized method other object. But non-synchronized method in same object can access without checking lock. Note: Constructor of class cannot be synchronized. Intrinsic locks enforce restriction on access to an object’s state and establish happens-before relationships. Every object has an intrinsic lock and a thread has to acquire the object’s intrinsic lock before accessing them and release it when it’s done. Other thread cannot access the object’s state till thread owns its intrinsic lock. It ensure that state change done by a thread will be visible to other thread which synchronize on the same monitor. After thread release lock which effect of flushing the cache to main memory so that object’s state change will be visible to other thread and that is called happens-before relationship. The synchronized and volatile constructs, as well as the Thread.start () and Thread.join() methods, can form happens-before relationships. The locks acquired by synchronized statements are the same as the locks that are acquired implicitly by synchronized methods. A single thread may acquire a lock more than once. Acquiring the lock associated with an object doesn’t prevent other threads for accessing fields of the object or invoking un-synchronized methods. The synchronized statement attempts to seek lock of object and the body of synchronized statements executed once it acquire lock of that object and unlock after completing the synchronized statements. If the method is member or instance of object then it will lock instance for which it was invoked. If the method is static, it locks the monitor associated with the Class object that represents the class in which the method is defined. Synchronize method control by its property-SYNCHRONIZED flag, which is check by method invocation instructions. If we consider int i++ it contains combination of multiple operation e.g. it reads value from memory, increment and puts write back to the memory. This operation is fine for single thread operation but might give wrong answer in multi-thread environment. It also have race issue means multiple thread can read the value at the same time. Atomic access ensures that action happens all at once. An atomic action occurs completely or doesn’t occur at all. The java.util.concurrent.atomic package defines classes that support atomic operations on single variables. All classes have get and set methods that work like reads and writes on volatile variables. That means, a set has a happens-before relationship with any subsequent get on the same variable. The atomic compareAndSet method also has these memory consistency features, as do the simple atomic arithmetic methods that apply to integer atomic variables . In java 5.0 java.util.concurrent.atomic package define classes that supports atomic operation on single operation. The JVM compiles these classes with the better operations provided by the hardware machine, CAS (Compare and Set). Using volatile variables reduces the risk of memory consistency errors, because any write to a volatile variable are always visible to other threads. What’s more, it also means that when a thread reads a volatile variable, it sees not just the latest change to the volatile, but also the side effects of the code that led up the change. In a multi thread environment object make their own copy of object in threads local cache except volatile variable that means volatile will have only one copy in heap which will updated by thread and immediately reflect to other Thread. There is no flush of local’s thread cache memory after completing the process. i +=5 invoking by two simultaneously thread give result 5 or 10 but it guarantee to see immediate changes. Use of volatile: One common example for using volatile is to use a volatile boolean variable as a flag to terminate a thread. Declaring static variable means there will be only copy associated with class it doesn’t matter how many object get created for that class. The static variable will be accessible even with no Objects created at all. Thread may have locally cached values of it. This means that if two threads update a variable of the same Object concurrently, and the variable is not declared volatile, there could be a case in which one of the threads has in cache an old value. Even if you access a static value through multiple threads, each thread can have its local cached copy! But a volatile variable will keep only one copy in memory and shared across the threads. So where volatile only synchronizes the value of one variable between thread memories and “main” memory, synchronized synchronizes the value of all variables between thread memory and “main” memory, and locks and releases a monitor to boot. Clearly synchronized is likely to have more overhead than volatile. A volatile variable is not allowed to have a local copy of a variable that is different from the value currently held in “main” memory. Effectively, a variable declared volatile must have it’s data synchronized across all threads, so that whenever you access or update the variable in any thread, all other threads immediately see the same value. Lock object behave same as implicit locks, which is used by synchronized code. As with implicit locks, only one thread can own a Lock object at a time. Lock objects also support a wait/notify mechanism, through their associated condition object. Each time an object is created in Java, it goes into the area of memory known as heap. The Java heap is called the garbage collectable heap. The garbage collection cannot be forced. The garbage collector runs in low memory situations. When it runs, it releases the memory allocated by an unreachable object. The garbage collector runs on a low priority daemon (i.e. background) thread. You can nicely ask the garbage collector to collect garbage by calling System.gc() but you can’t force it. In some cases in multi thread environment deadlock situation occured means two or more thread are blocked forever, waiting for each other. Explain types of references in Java? Garbage Collector won’t remove a strong reference. A soft reference will only get removed if memory is low. So it is useful for implementing caches while avoiding memory leaks. A weak reference will get removed on the next garbage collection cycle. Can be used for implementing canonical maps. The java.util.WeakHashMap implements a HashMap with keys held by weak references. A phantom reference will be finalized but the memory will not be reclaimed. Can be useful when you want to be notified that an object is about to be collected. Access modifier depicts how other classes access a class and its members (methods and variable.